I just wanted to say ‘have a good week’! We’re leaving this afternoon for Paris and we’ll be back next Tuesday. Thank you to everyone who has given me so many wonderful suggestions. I’m writing them all down in my Paris City Guide Moleskine. (I got this idea from Jeska) My camera is all charged up and I somehow managed to finish my very secure (hopefully from pickpockets) tote bag. I will have a billion photos to show you when we get back. You might catch a tweet or two from me while we’re gone, but mostly I’m trying my best to be ‘unplugged’ for the week and eat as many macarons as I possibly can. Would anyone like to wager on just how many I can consume in 7 days? I kinda don’t want to tell you, in case it’s all gone before I get back, but we’re expecting a shipment of Heather Ross’ Far Far Away collection this week. It’s made of that lovely double gauze cotton that is so nice to make clothing with. Yes, you can make a dress out of unicorns! 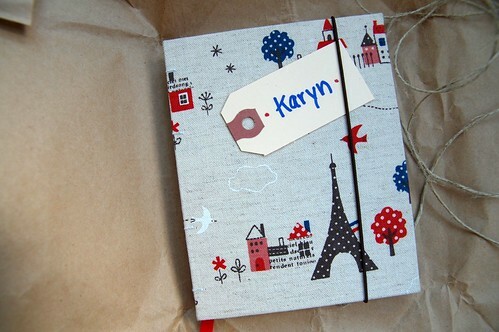 This sweet handbound notebook was given to me by Melodie using Kokka’s Eiffel Tower fabric. It’s so adorable, I don’t know if I’ll be able to use it, but I promised I would. I can’t believe I’m actually going on vacation! Have a wonderful fantastic lovely time! Can’t wait to hear about your adventures and see your pictures when you are back! Have an wonderful time Karyn! I can’t believe how happy I am that you are going on vacation! Have a great trip! I hope you’re taking in Le Petit Atelier de Paris. I’m dying to visit that shop. Can’t wait to see pictures from your adventures. I hope you’ll rest and come back feeling relaxed and inspired. Bon voyage, je te souhaite la bienvenue en France! have fun in my country !!!! Have a nice time in Paris, and if you can take a look at Lena Corwin blog, she is now writting from Paris with beautiful photos and tips. alors bon voyage et amuse toi bien à Paris! there are other nice shops in this street. enjoy karyn!!! you’ll love it! 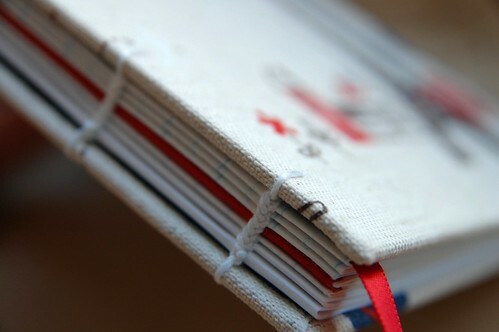 and the paris moleskine is the most helpful thing in the world, i was never without it! ps: i think i had 30+ macarons, 20 cafe cremes, 8 quiches in 10 days. saw the unicorns! so exciting to see it in real life. hope you’re having an enchanting time. eat a macaroon for me. Ohhhh.. Lucky you! Have fun, I can’t wait to see the pictures! Hope you’re having a great time, Karyn! And glad you liked the notebook. Now I feel like such a bully. You don’t have to use it if that makes you happier! laduree macaroons are about the best thing on this planet. i’m so jealous! hope you have an amazing trip!